Open house hours end at NOON on the 1st Saturday. The Clubhouse is not open on Field Day weekend and may also be closed when major holidays fall on Saturday (e.g. Christmas). 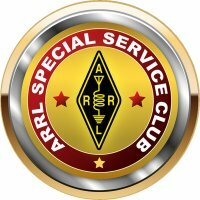 Club members and their guests, hams, and all visitors interested in amateur radio are welcome to stop by the Clubhouse on Saturdays. Please sign the Visitors Logbook in the kitchen, say hello to your Clubhouse Host, grab a cup of coffee and a tasty doughnut, and chat with the other visitors. This is the place where ideas flow! You're bound to learn something new at the Clubhouse about radio stations, equipment, electronics, antennas, events, trouble shooting, emergency communications, or operating techniques. On some days, you may find a member stepping forward to give a brief informal presentation on a topic of general interest. And if you're a new visitor, be sure to ask a Club member to give you a tour of our operating positions, the Library, and the Antique Radio Museum. On the last Saturday of the month, a Mini Flea Market and Swap Meet for Club members is typically the main event going on in the classroom. And starting around 11:30 AM, Club members and their guests enjoy free chili hotdogs (sometimes spaghetti, depending upon the whims of Chef Paul). See the Clubhouse page for more information, map and directions.